The attached screenshot shows a strange graphical glitch (straight lines) with the newest version (8.51) of the HD texture pack. I have tried both the 2160p and the 1080p version with no difference in the outcome. The lines disappear when I disable custom textures. Edit: On another person's PC, which still had an old version of the texture pack (8.1) installed, the lines were not present. After an update to 8.51, however, they appeared there as well. Thanks for letting me know. It's weird that this issue is only now showing up in later versions, as it's been there all along. 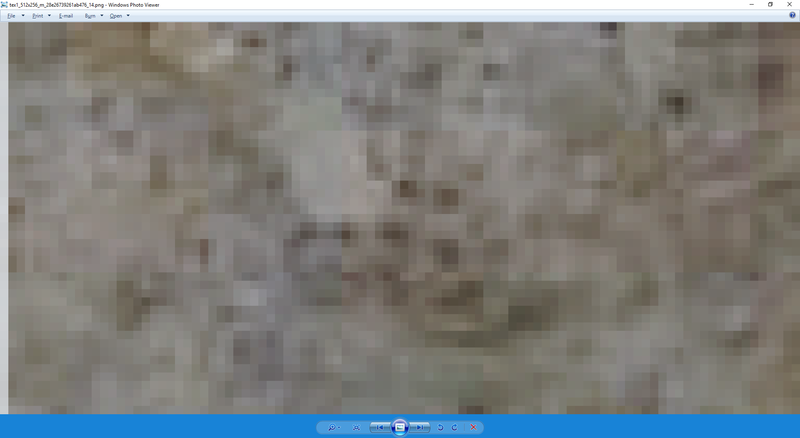 I extracted the texture from the original environment archive that bruno sent me almost 3 years ago, and it has that row of white pixels to the left. I never noticed it before, I'm not sure how it has stayed hidden for so long. I'll upload a fixed pack soon. Edit: Working on this is triggering some memories, not sure if they are real or not. I think I may have fixed this before, but eventually went back and grabbed bruno's original textures. I'm also going to tone down the mipmap effects used here, they kind of hurt my eyes. Edit²: Here's the quick fix. I'll reupload the packs tomorrow, but if you don't want to download the whole thing over again just extract whichever version you want into the pack and overwrite the old texture. The attached texture indeed fixes the issue. Thank you very much! Would anyone be able to share the download link (if still active) or the download itself of the final build of Rickv123's Xenoblade Expansion Pack before its discontinuation? Apologies if this is the wrong place to ask but it was the only place I could think of and it was linked to this pack, although it's the most recent draw distance patcher that I am really after (I have an older build). Rickv123 seems to be inactive now but if you do read this - thanks for all of your contributions. Main packs have been updated with the fix. @EmuMind: Unfortunately I don't have it anymore. I had it (along with several other files) on my Mega account which got closed a few months ago. I'm sure someone around here still has it, although I really wish Rick would have made a stand-alone patch for the draw distance. There is also some draw distance codes on One More Try's post, but I've never tested it to see how effective they are compared to the patch. @Bighead It was around a year ago that I was last experimenting with the different implementations but I believe Rickv123's draw distance patch was more sophisticated than the object draw distance code and presumably he developed it further since then. I was actually using successfully it in tandem with the 60fps, monster draw distance and partial npc draw distance codes (and the texture pack of course) - the only issue I hadn't eliminated was some stuttering perhaps every 30 seconds or so. A standalone patcher as it was originally would have been nice but Rickv123 did make it possible to just apply the patch with restriction mode although I now see that he removed that in his 11/15/2017 update, perhaps there was a another method detailed in his deleted thread? It's a real shame that the program and all of the associated information is lost, hopefully someone can share it. Like all 3 of Shulk's monado, and the mixed version of Zanza and Meyneth's monado? How accurate are the screenshots from the OP? Based on what I'm reading it got a lot more accurate since. Do the portraits match SD yet? (09-10-2018, 05:44 AM)Smashbro29 Wrote: How accurate are the screenshots from the OP? Based on what I'm reading it got a lot more accurate since. Do the portraits match SD yet? The pack is a BIT more accurate in some areas, but HD portraits are still the same as they always have been. They'll probably never match the originals unless someone new steps up to volunteer for the job; too much work for what is basically considered a done deal at this point. (09-11-2018, 07:51 AM)frozenwings Wrote: The pack is a BIT more accurate in some areas, but HD portraits are still the same as they always have been. They'll probably never match the originals unless someone new steps up to volunteer for the job; too much work for what is basically considered a done deal at this point. What are the steps? Does the artwork exist for them in HD?